A cutting edge Publisher of Genre Fiction, Pro Se Productions announces the debut of its fifth series in its Pro Se Single Shot Signature line of digital singles. New Pulp Author David White takes on Heaven, Hell, and everything in between with the debut of Magee, his Pro Se Single Shots series. Banished from on high for standing up to the archangel Michael, the being now known as Magee finds himself on Earth, stripped of his wings. Literally, as they were torn from his back. Left to his own vices, this fallen angel discovers he has many. In Magee: Knight From Hell, a killer is on the loose, one that no mortal means can stop. Magee begrudgingly finds himself involved in the hunt for this mystical murderer, alongside the only being he might call friend- a cultured and wealthy werewolf named Princeton. 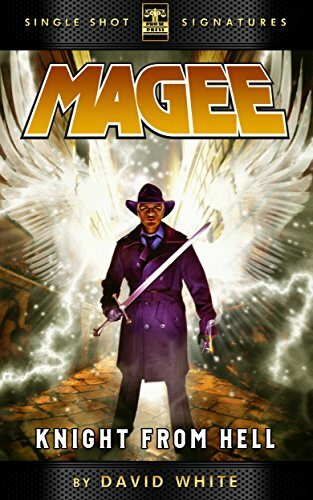 As Magee fights his way through his own issues, he finds that horrors of the past may mean more to his present than even a disgraced angel can survive. Featuring Cover Design and Art by Jeffrey Hayes and Digital Design by Russ Anderson, Magee: Knight from Hell is now available for download for 99 cents at Amazon, Smashwords, Barnes & Noble, and www.prose-press.com.